So I’m really loving my As I Am products as they leave my hair moisturised an bring out my natural texture. 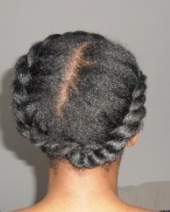 I flat twisted the sides and did loose twists in the middle for versatility. Here are the styles I’m rocking this week.